McCord HVAC, Inc. is a leader in commercial and industrial heating, ventilating and air-conditioning systems. We have been helping residential and commercial customers by providing exemplary services for over 20 years. We help to maintain indoor air quality through adequate ventilation with quality filtration and thermal comfort. Our full-line HVAC services include selling, repairing, replacing and installing wide range of equipment such as humidifiers, water heaters, thermostats, indoor air filtration systems, gas & electric heat pumps, air conditioners and zoning systems. Take advantage of our Planned Maintenance Agreements. Twice each year, in the Spring and again in the Fall, we come and service your Heating and Air Equipment to keep it running efficiently and keep it in top condition. Installation/replacement/service: We service or repair all brands. If your existing system needs to be replaced we will go over all the options that best suits your needs, and fits your budget. Below are before and after pictures of a recent job. Hover over picture for more information. McCord HVAC offers a complete lineup of high-quality installation, repair, and other services related to commercial and industrial HVAC systems. Our technicians are extremely knowledgeable and experienced working on installation, design, retrofits, maintenance, and automation projects. Many different kinds of businesses and institutions have relied on McCord for years to keep their operations running. Our customer service rankings are some of the highest in the region. We routinely handle projects related to heat pumps, air handling units, gas-fired heaters and more. We have experience in all lines of equipment. 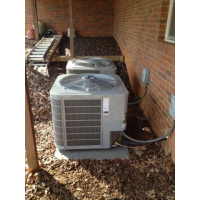 Call McCord HVAC today at (770) 459-3883. McCord HVAC technicians have the knowledge, skills, and experience to complete heating service and other projects quickly and professionally. We install the latest durable gas furnaces that are extremely efficient. 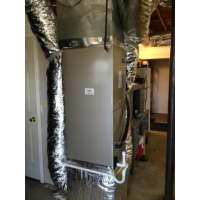 We sell, install, and maintain all popular lines of furnaces. We also sell, install, and maintain high-efficiency heat pumps that are used to both cool and heat homes and businesses. Call McCord HVAC today at (770) 459-3883. McCord HVAC has years of experience working on all kinds of air conditioning installations, repairs, maintenance, and other projects. We offer 24-hour service with quick response. Our technicians use the most efficient and cutting-edge technology in the industry. When you need service for a heat pump, you can count on McCord technicians to do the job right. Call McCord HVAC today at (770) 459-3883. Whether you have a regular gas furnace, electric furnace or electric heat pump we will be able to determine the problem and do our best to repair your system. We will also check to see if your heat strips are working properly. We provide a full range of gas and electric heat pump services. We feature high-performance, high-efficiency equipment to provide quiet, year-round comfort. Our technicians are experts at thermostat compatibility, defrost technology, and filter drier system protection from moisture and contaminants. We routinely service systems that are Energy Star compliant and use earth-friendly refrigerants. Don’t let gas or electric heat pump problems increase utility bills, shorten equipment life, or cause frequent, unexpected breakdowns. Call McCord HVAC today at (770) 459-3883. A quality dehumidifier can be used in a home or other property to prevent discomfort, mold and mildew, wood rot, damage to paint, condensation, and insect infestation. McCord HVAC can give you a wide range of options related to portable and whole home dehumidification equipment. This quality, cutting-edge equipment will ensure the humidity in your property is optimal, even in the summer time. Not only will your home be more comfortable, you’ll be surprised at your utility savings resulting from the removal of high levels of humidity. Call McCord HVAC today at (770) 459-3883. Humidifiers help to improve air quality and alleviate symptoms of dry air, such as sinus headaches, dry skin, sneezing and coughing. For allergy and asthma sufferers, having humidifiers greatly helps minimize their symptoms by moisturizing the air during the dry winter months. Humidifiers come in a variety of sizes (or gallon output), and humidification types such as (warm-mist, cool-mist evaporative, ultrasonic, impeller, vaporizer). Whole-house humidifiers, or console humidifiers, are larger portable units capable of humidifying multiple rooms and very large areas. Room humidifiers are smaller units better suited for small to medium sized rooms for home and office. For asthma and allergy sufferers, it is important to ensure the system is serviced at least twice each year to ensure clean moist air continues to flow into their environment. Did you know indoor air can be more than 100 times more polluted than outdoor air? For many years, customers of McCord HVAC have relied on us for all of their indoor air quality needs. If you suffer from asthma, allergies, hay fever, or other breathing difficulties, our knowledgeable and trained technicians can ensure your home is healthy and comfortable. We’ll perform a professional assessment, and give you a wide range of options including the latest air cleaners and purifiers. McCord professionals will present a solution that eliminates most airborne allergens and makes every member of your household breathe easier. Even the tiniest particles can be tracked, and nearly all germs and mold can be killed. The removal of pathogens, bacteria, and germs will protect your family from colds and other illness. 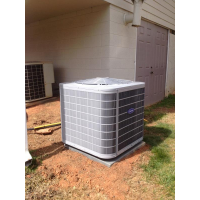 Call McCord HVAC today at (770) 459-3883. McCord HVAC & Refrigeration knows that various areas of homes and businesses have different cooling and heating needs. We can help you control the temperature in these areas based on their use and occupancy. Our technicians consider the purpose of the room, whether the room is exposed to sunlight, and occupants’ special needs. A customized zoning system can then be designed and installed so that every square foot of the property is comfortable and usable. We have years of experience creating special humidity, heating and cooling zones. We make rooms usable whether they are heavily or seldom used. Best of all, the home or business owner is in complete control because of the latest cutting-edge technology. McCord technicians look at air conditioner size, ductwork, multifloor dynamics, dampers, thermostats, and many more factors. Let us end your temperature frustrations and help you save money on utility costs. 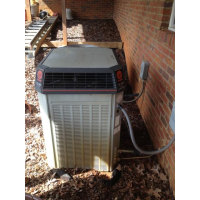 Call McCord HVAC today at (770) 459-3883.